Can 'The Lost Tapes' review | What Hi-Fi? There’s no two ways about it: if you’re unfamiliar with Can, then The Lost Tapes is not the ideal place to get acquainted. This release expects (if not outright demands) a particular perspective and, ideally, a working knowledge of the avant-pop powerhouse that was Can between 1968 and 1977. For those in the know, though, the discovery of until-now forgotten material from the time when the band was at the height of its powers is a win of the five-numbers-plus-bonus-ball variety. While the band’s Weilerswist studio was being dismantled for transportation to the German Rock’n’Pop Museum in Gronau, over 30 hours of archived master tapes came to light. After painstaking editing by Can founder and keyboard player Irmin Schmidt, those masters are now available as a three-CD or triple-vinyl box-set. Schmidt was an award-winning conductor, a concert pianist and a personal student of Karlheinz Stockhausen when he formed Can in 1968, and it’s the tension and conflict between conservatorium academia and full-on psychedelic rock’n’roll that’s at the heart of what makes Can so singular. Jaki Liebezeit, Michael Karoli and fellow Stockhausen alumni Holger Czukay contributed drums, guitar and bass respectively, and the band invited American sculptor and poet Malcolm Mooney to provide vocals. 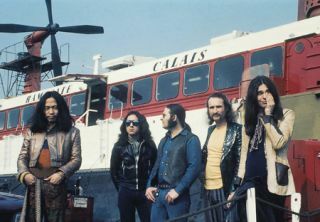 By 1970, though, his psychiatrist more-or-less insisted Mooney leave the band in an effort to protect his fragile mental health – undaunted, the musicians selected Damo Suzuki, a Japanese singer they encountered busking on the streets of Munich, as Mooney’s replacement. The majority of The Lost Tapes covers the period just prior to the 1969 release of the band’s debut Monster Movie to Suzuki’s departure just after 1973’s Future Days went on sale. It’s the quality and validity of the music on The Lost Tapes that makes this box-set so much more than a barrel-scraping exercise. Can always sounded like an advance party, an exploratory force reporting back from the blasted fringes of pop music – and the sense of striving, of constantly seeking to take flight inhabits the majority of these 30 pieces. All of the elements that made Can such a compelling proposition are in place: the relentless, periodically mesmerising repetition driven by Liebezeit’s unshakeable, funky drumming, the angular guitar and keyboard contributions, and an overwhelming sense of a microwave-style power-without-discernible-heat. In the case of the earliest recordings, Mooney’s often-improvised vocals have an unhinged intensity (Waiting for the Streetcar finds him ranting “are you waiting for the streetcar?” until the words lose all meaning), while Suzuki’s later contributions are gentler, if no less distinctive. Often there’s a sense of either imminent arrival or recent departure: Desert is closely related to Soul Desert (from 1970’s Soundtracks) and A Swan is Born either prefaces or postscripts Sing Swan Song (from 1972’s Ege Bamyasi), for example. Throughout, Can sound by turns tender and soothing, hypnotic and inexorable, straightforwardly rocking and atonally abstract, playful and intense. Julian Cope said Can “sounds only like itself, like no-one before or after”, and we can’t think of a better way to describe The Lost Tapes.